It’s an easy sentiment to understand. I have experienced the same sensation many times. The weather gods cooperate with enough breeze to move the boat when the auxiliary engine is shut down. But what if the wind isn’t cooperating, and what if I find myself in a powerboat, rather than a sailboat? I have a strong desire to be on the water, but our summer winds here in the Northwest are notoriously light and fickle. 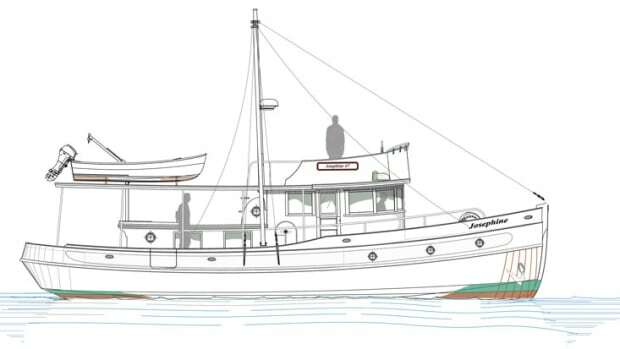 That’s why my choice of a vessel during summer is most often a powerboat, and why I’m often sketching a classic launch-type vessel on the drafting table. Once I have the rough perimeter outlined, my next step is to consider how to power my little launch. I consider the noise of the engine banging below in its engine box, and that amazing sensation of hearing only the water slide by the hull, silent yet not silent at the same time. 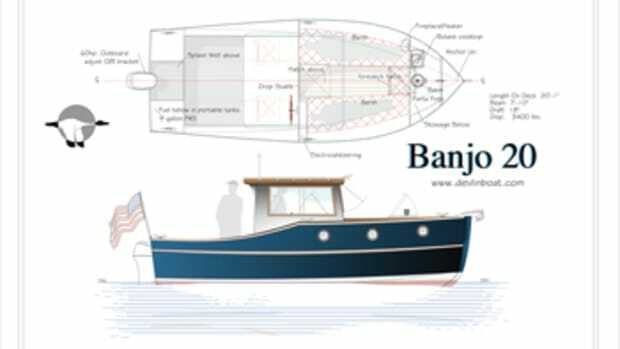 For simple powering of this design, the obvious options are a diesel inboard of small horsepower or an outboard in a well. But how about electric power? That would mimic the feeling of shutting down an engine and hearing only the water. For electric powering, I would need a hull that moves with minimum fuss and horsepower — a perfect description of my launch. 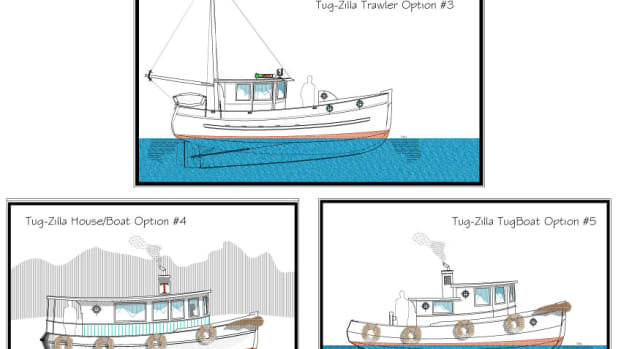 Her hull will be displacement-type, one that is very slippery and easily driven. 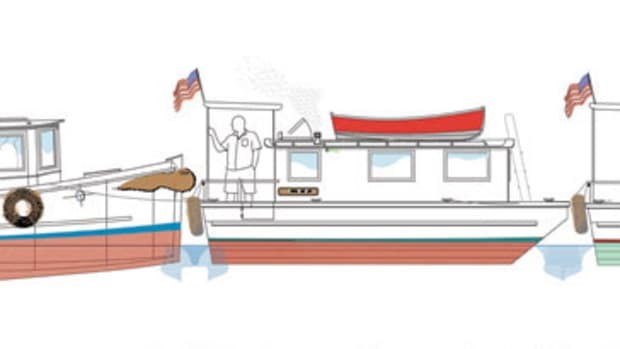 This type of hull would mate well with the relatively low horsepower of an electric drive system, and it would cooperate with the drive by not dragging her hind end, creating excess wake and wasting horsepower. As for the drive engine, I don’t want to reinvent the wheel; I want to stay with stuff that has been around for a few years, debugged after actual use in the field. Torqeedo offers two options that seem to make the most sense: the Cruise 4.0 FP pod drive, which is like a fixed saildrive mounted through the bottom of the boat aft, and the Cruise 4.0 R outboard drive in a well that lets the engine tilt out of the water for stowage. I love the idea of tilting the outboard clear of the water. It limits corrosion and fouling, and that leans me heavily toward using the outboard in the well. But a case can also be made for the Cruise 4.0 FP pod drive, which allows seating all around the stern in the cockpit and keeps the top of the pod below the cockpit sole level, out of sight and out of the way. Yes, some fouling would occur on the drive head below the boat, but it wouldn’t be too bothersome, and this arrangement offers an uncluttered cockpit — a real appeal to my idea of a proper launch. Lastly, I’ll need a hull configuration and accommodations for a day trip or limited overnights. The result is the Solar Sal 27, traditional in appearance but modern in application, use and technology. 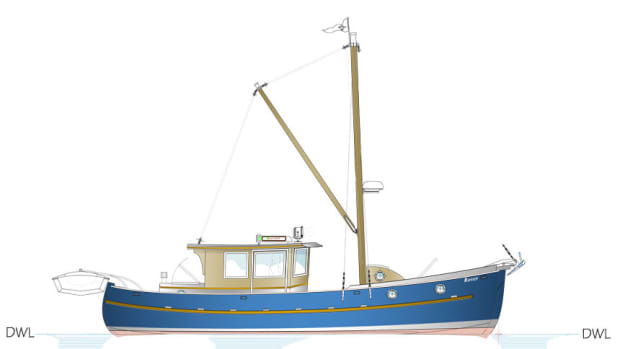 She has remote steering from the pilothouse and a removable tiller aft, on the rudder head. 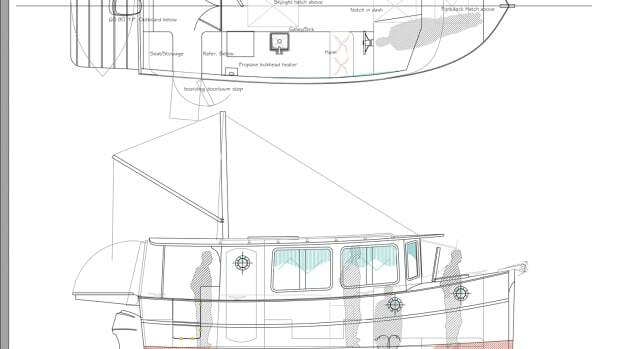 There’s room forward for a couple of berths and a Porta Potti or water closet. 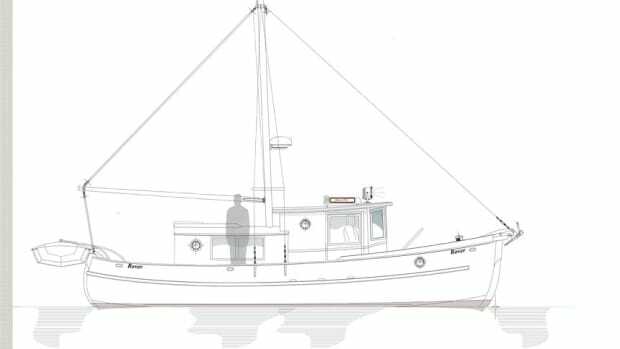 The house forward is not a full pilothouse, with its open back — only the fo’c’sle is locked — but the house will keep the wind and cold off the skipper at the edges of the boating season. In the height of the summer, when winds are light and temperatures are high, I plan to take the house windows out, stow them in a rack in the fo’c’sle, and let the slight apparent wind of the boat moving through the water cool me in my shaded helm seat. This is a method used on a smaller launch that I designed and built, and I keep the windows removed for the latter half of June, all of July and August, and most of September. Earlier than mid-June, the windows are in place, and I bundle up a bit to stay warm. I’m in the same mode for the last part of September and all of October. advantage of high-pressure times in the Northwest weather cycle. These fronts come at us with hard frosts at night and temperatures rising to the low 40s during the day, but who can resist that sparkling sky? Even though the sun is far away, it still feels magnificent to be out on the water. It’s wonderful to see snow on Mount Rainier and the Olympic range, and to have the amazing feeling of cheating Mother Nature for a brief respite from the oyster-gray sky and perpetual rain. The Solar Sal 27 has four 265-watt solar panels on her full roofline, augmenting the four batteries in her bilge and allowing virtually unlimited use of the electrics with either system. Under battery alone, the range at 6 knots looks to be close to 28 nautical miles or, more important, about 4.6 hours of running time. Remember, we are augmenting the batteries’ capacity with close to 1,060 watts of charge from the solar panels. 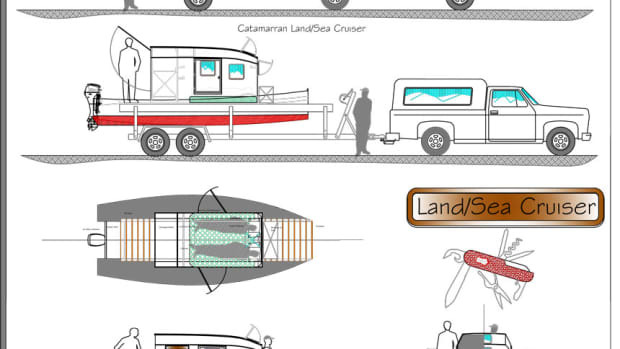 Time will determine the final numbers, but this truly looks to be the ultimate of dreams: a fully electric-powered vessel without the noise and smell of a gasoline or diesel engine, and without the never-ending cost of fuel. Imagine cruising with virtually no noise from the drive system, being able to converse with guests without elevating your voice and simply enjoying the water in a way that didn’t seem possible just a few years ago. To me, the dream is real.